The 44th Infantry Division was a division of the United States Army National Guard from October 1920 to November 1945, when it was inactivated after Federal Service during World War II. A second 44th Infantry Division existed in the Illinois Army National Guard from 1946 until October 1954, when that division was disbanded after federal service during the Korean War. 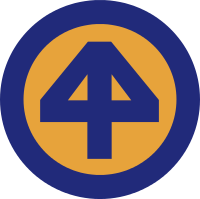 The 44th Division participated in the First Army Maneuvers in Upstate New York from 7–24 August 1940,:36 prior to being inducted into federal service for twelve months of training on 16 September 1940.:374:325:131 Posted at Fort Dix, New Jersey during 1940–1941,:131 the division's training culminated in the Carolina Maneuvers, September–December 1941. The 44th Infantry Division landed in France via Cherbourg, 15 September 1944, and trained for a month before entering combat, 18 October 1944, when it relieved the 79th Division in the vicinity of Foret de Parroy, east of Lunéville, France, to take part in the Seventh Army drive to secure several passes in the Vosges Mountains. Within 6 days, the division was hit by a heavy German counterattack, 25–26 October. The attack was repulsed and the 44th continued its active defense. On 13 November 1944, it jumped off in an attack northeast, forcing a passage through the Vosges Mountains east of Leintrey to Dossenheim, took Avricourt, 17 November, and pushed on to liberate Strasbourg, along with the 2d French Armored Division. After regrouping, the division returned to the attack, taking Ratzwiller and entering the Ensemble de Bitche in the Maginot Line. Fort Simserhof fell 19 December. Displacing to defensive positions east of Sarreguemines, 21–23 December, the 44th threw back three attempted crossings by the enemy of the Blies River. Mickey Rooney entertains soldiers of the 44th Division in Kist, Germany during a May 1945 jeep tour. 30 August 1944: Ninth Army, 12th Army Group. 10 October 1944: Ninth Army, 12th Army Group. 14 October 1944: XV Corps, 6th Army Group, for supply. 17 October 1944: XV Corps, Seventh Army, 6th Army Group. 8 April 1945: Seventh Army, 6th Army Group. 15 April 1945: XXI Corps. 17 April 1945: VI Corps. Medal of Honor - 1. Distinguished Service Medal (United States) - 2. Legion of Merit - 8. Legion of Honour - 1. Maj. Gen. Clifford R. Powell (September 1940 – August 1941). Maj. Gen. James I. Muir (August 1941 – August 1944). Maj. Gen. Robert L. Spragins (August 1944 – December 1944). Maj. Gen. William F. Dean (January 1945 – September 1945). Brig. Gen. William A. Beiderlinden (1 – 14 November 1945). Brig. Gen. Robert L. Dulaney (November 1945 – inactivation). Returned to U.S.: 21 July 1945. The 44th Infantry Division was reactivated in the Illinois Army National Guard in 1946, and inducted into federal service in early 1952 during the Korean War. It was disbanded after its release from federal service on 10 October 1954. On June 15th, 2017 the 50th IBCT was reflagged as the 44th Brigade Combat Team, and carries the lineage of the 44th Infantry Division. ^ Doubler, Michael D. "Civilian in Peace, Soldier in War: The Army National Guard, 1636–2000" (University Press of Kansas, Lawrence, KA, 2003), p. 190. ^ Memorandum for the Adjutant General of the Army from the Assistant Chief of Staff, dated 5 OCT 21, Subject: “Shoulder Sleeve Insignia for the 44th Division,” US Army Institute of Heraldry files, re: 44th Infantry Division, Fort Belvoir, VA.
^ a b Moenk, “A History of Large-Scale Army Maneuvers in the United States, 1935–1964”, (Fort Monroe, VA, 1969). ^ Combat History 44th Infantry Division 1944–1945, (New Orleans, 1946), p. 48. ^ Journal, HQ 44th INF DIV Arty, Entry for 23 Aug 44, Record Group 407, Entry 427, Box 10806, File344-ART-0.7, National Archives II, College Park, MD 20740-0001. ^ "44th Infantry Division: Victory". Militaria. efour4ever.com. Archived from the original on 18 May 2008. Retrieved 12 May 2008. ^ "44TH INFANTRY DIVISION". The Army Almanac: A Book of Facts Concerning the Army of the United States. US Army. Archived from the original on 31 May 2008. Retrieved 12 May 2008. ^ The 44th Infantry Division, A Condensed History from Its Birth in 1923, The National Guardsman, October, 1949, pp. 22–23. ^ OCS Form 10, Official Statement of Lineage and Battle Honors, “Headquarters Company, 44th Infantry Division, NG, Ill.,” dated 16 FEB 54 & 5 OCT 60, US Army Center for Military History files re: 44th Infantry Division, Fort McNair, VA.